I can honestly say that this past Thanksgiving has been my most favorite yet. I’ve never felt happier or more blessed to have all of our family in one place. 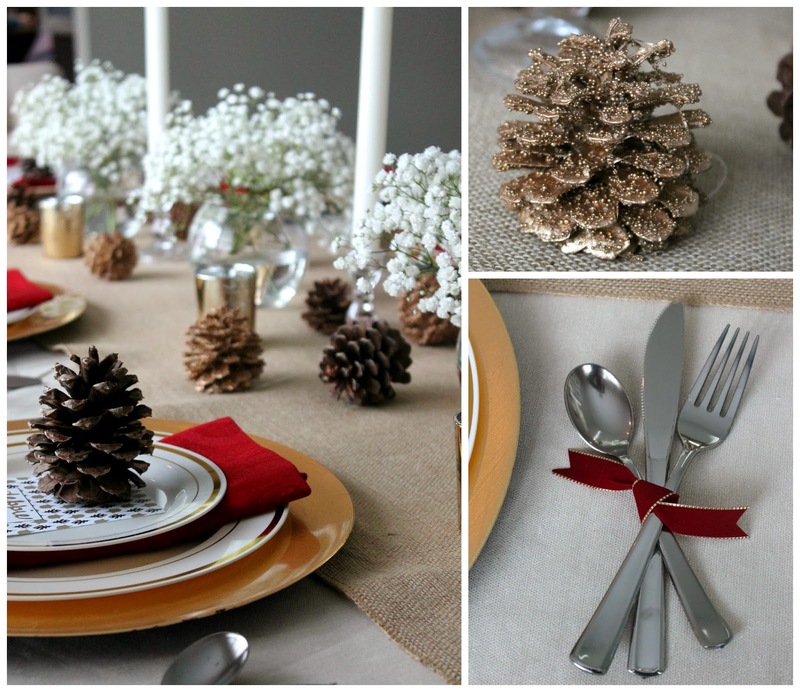 For our tablescape I decided to go with gold and cranberry colors, pinecones, baby’s breath and burlap! The smartest choice I made when setting our table was the upscale disposable china plates! Not only are these plates and silverware super durable, but after dinner we all just tossed our plates in the trash eliminating lots of extra clean up! Even the pups had a great time! 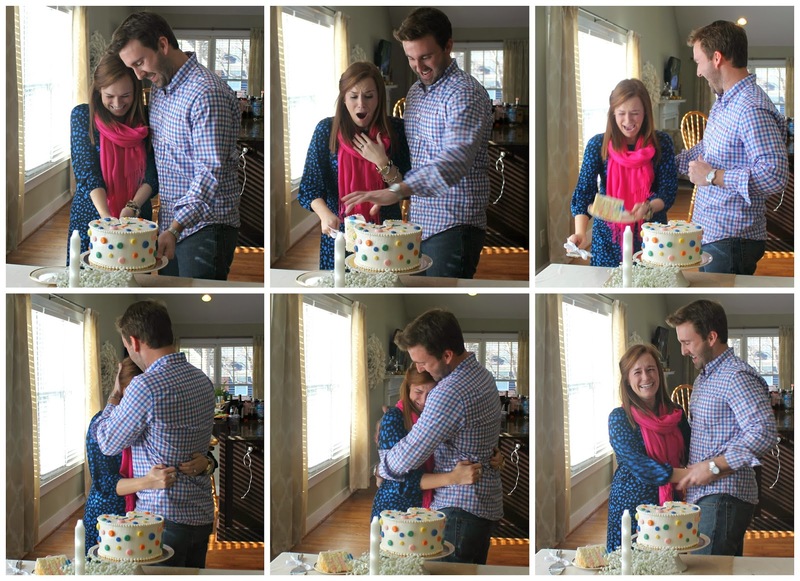 Couldn’t have celebrated Baby M’s gender reveal in a more perfect way! And in typical Thanksgiving fashion we ate…and ate…and ate lots of yummy food! This Thanksgiving definitely goes down as my favorite yet! Your table was absolutely beautiful! I love the burlap and pinecone. Beautiful tablescape! 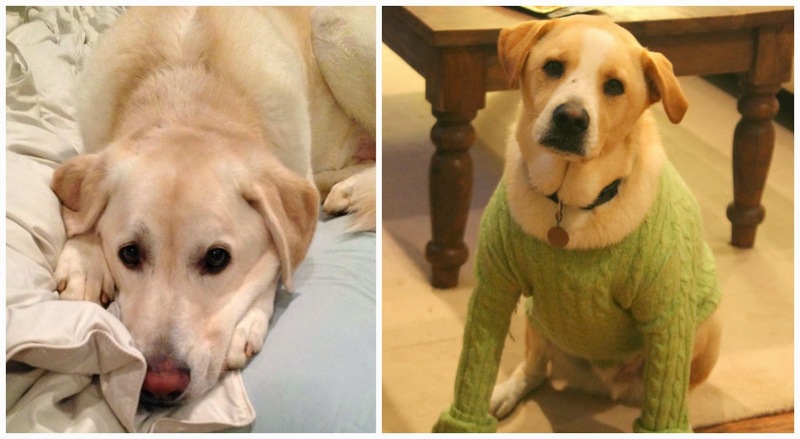 And the pup in the sweater…too cute! Everything looks so delish!! I can't believe those are disposable plates! Great call, you would never know by looking at them in the photos!! Love that veggie tray! Precious! Makes me want Thanksgiving dinner all over again! 🙂 Love all your details! Beautiful tablescape– it looks fabulous! And congratulations on your baby GIRL! The veggie tray is adorable! And I love your table decorations and the food looks delicious! I absolutely love it all! Looks beautiful!! It all looks so Martha Stewart! i want you to come and decorate my life. Every detail was perfection! What a beautiful table! I love that you used disposable plates 🙂 We used them on Christmas Eve (gasp!) every year since we always have 20+ people! Congrats on your baby girl!! Oh this makes me want it to be Thanksgiving again! I LOVE your table. Where in Michael's did you find the burlap runner? I only found a small one that is supposed to be used for crafts when I went to look last week. Love it all girl! Your tablescape looked gorgeous!! Question…how much are those gold chargers? I am trying to find some that are cheaper than $15 a piece. I loved your video!! I voted blue, but you are pink!!! So smart to use disposable china … we used all disposables during our gender reveal and it saved so much clean-up time in the kitchen afterwards! Disposable china? You had me fooled! You are too smart! Those place settings are PERFECT! And congratulations on your little girl, how exciting!! Love the table setup and so envious at your forethought to use disposable plates. I was in the kitchen for two hours cleaning dishes! you table is GORGEOUS!! I am so stealing the disposable china idea for Christmas – where did you buy yours? !And congrats on your baby girl! 🙂 Such fun gender reveal pictures! Everything looks beautiful, I love the pinecones!! 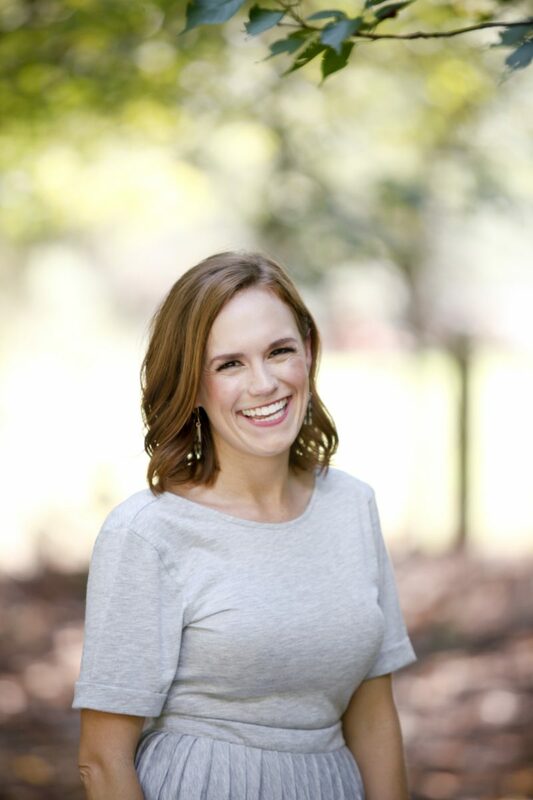 The pictures of yalls reveal are SO special- congratulations on your sweet baby GIRL!! Lovely table and décor! Congrats on your first hosting of family Thanksgiving! That series of photos of you guys finding out about the baby is the sweetest. Congratulations!! Your little girl is going to be adorable. Loving the Thanksgiving tablescape – gorgeous! I love the gender reveal pictures and what a BEAUTIFUL tablescape! Hey There, new reader. Just wanted to say congratulations on your baby girl! I love the gender reveal pictures! They are so sweet! I wish we had done something a little more creative, but my husband was all business, he just wanted to know ASAP. Haha.